War is a word consisting of three letters. Reading and hearing about it in books and movies sounds terrifying but living in it is a completely different scenario. Sometimes I feel I am trapped in a seemingly endless conflict. Sometimes I think how the sound and effect of war are very fast and devastating and how the sound and effect of building are very quiet and empowering. As a young woman living in a war-torn country, I lose hope in everything around me when all doors are strictly closed. But I believe there’s hope because since I was a child my father used to tell me, “women build nations”. I never understood the meaning of his words until I grew up. In the beginning it was a theoretical understanding which I learned from books, discussions and historical movies. 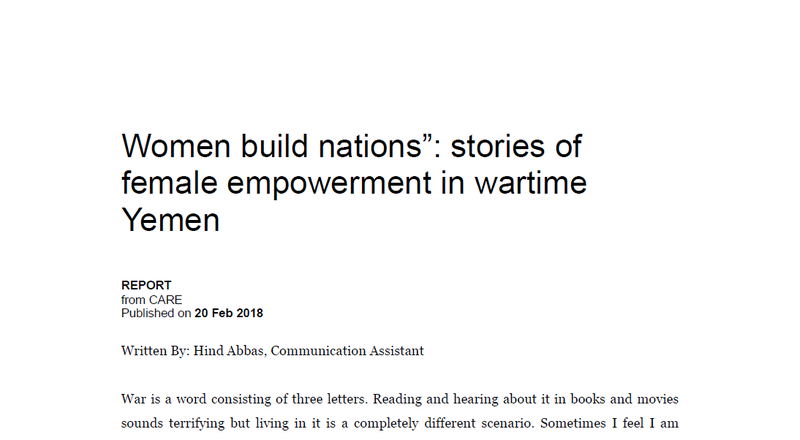 But when the war started I was able to understand the true meaning of his words I lived it, felt it and heard it in every Yemeni house through powerful stories of women who’s filled with an exceptional resilience spirit.